1899, South Africa: As the Boer War rages, Captain Ingo Finch of the Royal Army Medical Corps pieces together casualties at the front. Then, recovering in Cape Town, he is woken by local police. A British officer has been murdered, and an RAMC signature is required for the post-mortem. 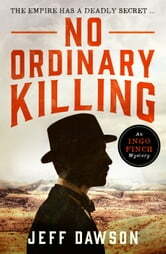 Shocked by the identity of the victim, the bizarre nature of the crime and what appears a too-convenient resolution, Finch turns detective. He is soon thrust into a perilous maze of espionage and murder. An extraordinary and unputdownable historical crime thriller and Kindle bestseller, perfect for readers of Philip Kerr and Abir Mukherjee. A British Army doctor is in and around Cape Town during the Boer War and becomes entangled in a sinister plot. The local police, military police and divers villains are also in on the action along with an Australian volunteer nurse. The pace is cracking, the story line twists and turns to the extent it needs a few "with one bound he was free" episodes to keep the plot going but it is none the worse for that. Good dialogue between the characters. Blood, gore and a reasonable amount of humour keep the reader involved to the end.